If you look closely enough, you'll see the holes in its head from the 22 caliber snake shot rounds that killed it. This snake was hiding up against the side of my house inside the yard. 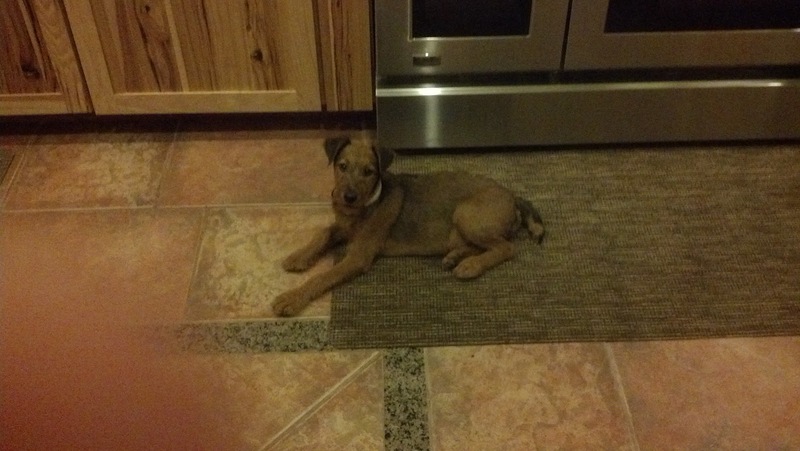 I discovered it when I went to pick up a toy my Irish Terrier puppy had left when he ran around the house. It was dark and the snake's natural camouflage made it nearly invisible. It didn't rattle until I actually almost stepped on it in the dark. Yes, it did strike my dog. The little guy was huddled up against the door into the house suffering from shock. I grabbed the dog and headed straight for an emergency Vet's office. In answer to all comments about snake training, snake vaccines, watching my dog closely, keep it on a leash, etc. The little guy is a little less than four months old. The youngest the snake trainers will take him is 4 months and I already had an appointment for later this month. The snake vaccine is usually given in February so it will be strongest in the spring when the snakes come out. He was inside a fenced yard playing around my patio. Crap like this sometimes happens no matter how many precautions you take. And, yes, I often carry a handgun to handle situations like this, but neither I nor the puppy saw the snake in time to prevent the strike. The handgun made short work of any possibility of this snake causing any further problems. Fortunately, I've been overfeeding him and have gotten his weight up to almost 15 pounds so there was some body mass there to help with the snake venom. He goes on a couple of half to three-quarter mile walks almost daily to build up some muscle and bone strength so he was very healthy. And, he has every vaccination known to veterinary science, except snake, so opportunistic canine diseases are unlikely. Barkley (his name) has been in the vet hospital now for over twelve hours, received lots of fluids, some narcotic pain killer, and two (and counting) vials of antivenin. He's mostly out of shock and doing well considering the circumstances. I'm going to go visit him in a few minutes because they are scheduled to do blood work on him soon to see how he's doing. I want the results first hand. So, you folks that have an aversion to handguns and people that carry them, think about this a while and what you would have done if it had been your dog. The red bandage is to protect his IV and the cone is because he kept trying to chew it. They call it a 'No Cone' because they get tired of telling them 'NO' when they start chewing at the equipment. He's eating and recognized me the minute I walked in the door. Looks good for the little guy. I'm going to get a flashlight now and wander around the house to see if there are any more snakes hanging around. Update 2 October, 2012 12:25AM: Got a call from the vet and Barkley's clotting factor improved and he said I could come get him. The little guy is home running around chewing on a rawhide bone. When I went to pick him up, he literally ran over to me. This was far, far different from the little puppy in shock from a rattlesnake bite that I took to the hospital Sunday night. I may post a picture of him with the remaining swelling, but first Barkley and I are going to bed. Don't ever say anything bad about an emergency veterinarian. Update: I put together a blog post about snake avoidance training <link>, do this if you have any worries at all about your dog. If you take long walks in the wilderness or take it camping with you, it would be a really good idea.